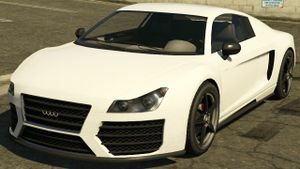 A 9F in Grand Theft Auto V.
The Obey 9F is a convertible sports car featured in Grand Theft Auto V. It was first mentioned in the November 2012 Game Informer preview of GTA V and seen in the first and second trailers for GTA V.
The 9F is designed to resemble a convertible variant of the Audi R8, and features a retractable roof. The headlights appear similar to those of a Maserati Ghibli, while the taillights appear to be from a Noble M600. GTA V, pre-release (Rear quarter view). The 9F is a fast vehicle, capable of accelerating from 0 to 60 mph within 4.8 seconds. Its 4.0 L 441 hp engine is powerful enough to rocket it to a top speed of 191 mph (307 km/h), an acceptable top speed for a mid-high performance car. Like with the real-life Audi R8, the 9F is mid-engined and uses all-wheel-drive, allowing for stability and good traction in corners. Also, as it is mid-engined, it is less likely to shut down after several big collisions compared to front-engined cars like the Penumbra or rear-engined cars like the Comet. The 9F has very good braking power as well, again due to its all-wheel-drive system. Its name may be an allusion to the German Porsche tuner 9FF. The 9F is internally named "NINEF". 9F Cabrio, the convertible version of the 9F. This page was last modified on 29 April 2015, at 22:43.